Today, the Senate reconvened resumed consideration of H.R. 933, the House-passed continuing resolution that funds the government through the end of September. At 2 PM, the Senate will hold three votes: on an amendment from Sen. Pat Toomey (R-PA) that would provide $60 million for operations & maintenance for the Department of Defense, offset by the same amount of cuts elsewhere, on approval of the Mikulski substitute amendment, and then cloture on H.R. 933, as amended. Senate Majority Leader Harry Reid (D-NV) has indicated he wants to begin consideration of Senate Democrats’ budget (their first since 2009) today and conclude debate on it by the end of the week. Yesterday, the House dealt with the expense allocation for certain House committees. They passed (272-136) H. Res. 115 which provided for the expenses of certain committees of the House of Representatives in the One Hundred Thirteenth Congress. If you are wondering which committees and how much money being addressed, below are the approved figures from noon, January 3, 2013 through noon Jan. 3, 2015. However the amount approved was divided exactly in half for each of the 2 years in the Congressional session. Committees and Amounts- The committees and amounts referred to in subsection (a) are: Committee on Agriculture, $10,072,374; Committee on Armed Services, $13,127,070; Committee on the Budget, $10,277,648; Committee on Education and the Workforce, $13,905,526; Committee on Energy and Commerce, $19,041,032; Committee on Ethics, $6,040,918; Committee on Financial Services, $14,788,964; Committee on Foreign Affairs, $14,776,224; Committee on Homeland Security, $14,067,176; Committee on House Administration, $9,201,120; Permanent Select Committee on Intelligence, $8,779,516; Committee on the Judiciary, $14,154,032; Committee on Natural Resources, $13,111,658; Committee on Oversight and Government Reform, $17,880,874; Committee on Rules, $5,714,816; Committee on Science, Space, and Technology, $10,565,510; Committee on Small Business, $5,985,376; Committee on Transportation and Infrastructure, $16,364,614; Committee on Veterans' Affairs, $6,097,092; and Committee on Ways and Means, $16,846,822. The House Republicans have responded to President Obama having time to Pick his winners and losers for the March NCAA Basketball tournaments but not having time to get his budget submitted. Will share more on this in a separate article. Senate Republican Leader Mitch McConnell was on the floor this morning marking the upcoming third anniversary of President Obama signing his unpopular health care bill into law. And, he was none too happy! Speaking next to the now infamous photo of over 20,000 pages of printed Obamacare regulations, McConnell again made it clear that “Republicans have long warned that Obamacare would have a devastating impact on our country. I’ve spoken about 100 times on the Senate floor against Obamacare, and I’ve warned about its consequences: increased premiums, lost jobs, higher taxes. "Unfortunately, many of those things have already started happening – and the federal government has only just begun implementing this law. . . . Obamacare has already become a regulatory nightmare. Just look at this chart next to me. Right there on the chair in the photo – that’s the original Obamacare law. Remember the legislation that was so long, former Speaker Pelosi told us we had to vote for it to find out what was in it? That monster of a bill was hundreds and hundreds of pages long. But that’s nothing compared to the regulations it spawned. 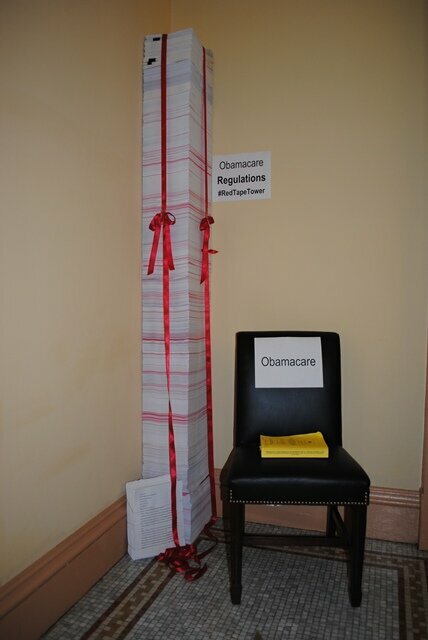 The more than 7-foot tall stack of paper right next to it, that’s what has become known as the ‘Red Tape Tower’ It’s nearly 20,000 pages worth of Obamacare regulations. And that’s just what the bureaucracy has dreamed up so far. You can only imagine how much more is yet to come. Amazingly, even supporters of this unworkable law are acknowledging this application is a problem. Today, on Ezra Klein’s liberal Wonkblog at The Washington Post, Sarah Kliff addressed the 21 page Obamacare application, “Why on earth would the federal government create such a complex form to obtain a public benefit? For me, at least, the flowchart below provides a bit of an answer. It comes from the National Association of Insurance Commissioners, which represents the regulators who oversee each state’s insurance market. It is an attempt to draw up the most basic, simple questions to determine eligibility for insurance subsidies or Medicaid. You don’t have to spend much time with the chart to get that, it’s really not simple at all. It can take as many as six questions just to determine an individual’s ability to buy insurance. An eight-question chain sorts out eligibility to eschew employer coverage and buy an individual plan with a tax credit instead.” This is a flowchart, with — you guessed it — 21 steps on it. Go Sen. McConnell! We need someone to keep speaking for us in the Senate. Has your Senator spoken out 100 times in the Senate against Obamacare? If not, are they even speaking out? Unless you follow-up on all their efforts, or even ask them, they may never do so. Silence is not often golden; it can be a failure to represent you on this serious issue. Tags: Obamacare, Oppressive regulations, draft application for exchanges, House committee expense funding To share or post to your site, click on "Post Link". Please mention / link to the ARRA News Service. Thanks!